100 posts in 100 days, my first perfect score since high school. It has been a lot of fun and I have learned a few things. My plan is to keep going for as long as I can. Keep reading and look for a cute little calico dog. The pattern for which I waited until it went on sale. I also have 11 of the 24 flower motifs done for row 3 of the big rose doily; row 4 will be a surprise. Speaking of high school, I still have my first learn to knit swatch. I wonder how many of my classmates still have theirs. This is what Rick brought home for dessert. Isn’t he sweet? He has been really understanding. Considering I set up a light box in the living room and dinner has been late or take out much more often than before I started this blog. 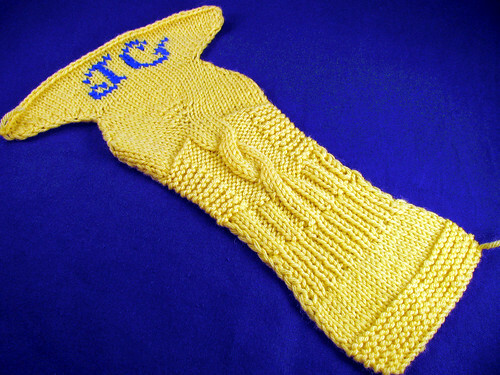 This entry was posted on Saturday, January 31st, 2009 at 3:00 am and is filed under Knitting. Tagged: Knitting. You can feed this entry. You can leave a response, or trackback from your own site. I love that you kept your first knitting swatch! 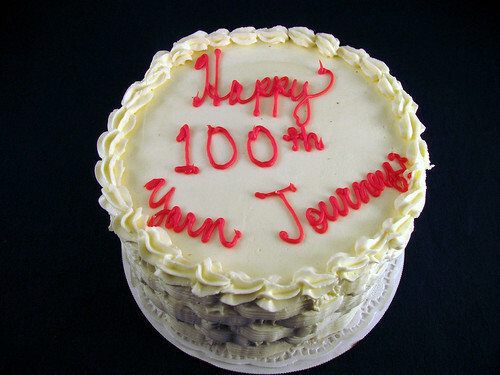 A husband who brings you home a cake for blogging 100 days and who lives with a woman with a fiber habit is a keeper!